For the last few months, I’ve been hard at work researching the history of embroidered bookbindings and the techniques used to create them. I have about 20 pages of notes, but I thought I'd give a brief overview of what I've learned. Embroidered books were at the height of their popularity in the 16th and 17th century, and were produced most predominately in England. This type of binding signified that the book was especially cherished by its wealthy (usually Royal) owner, and is most often found on religious books. 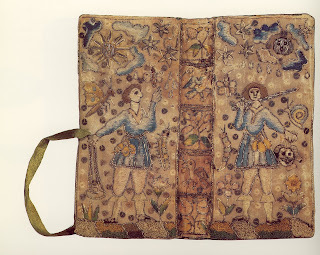 The embroidery on this book of Psalms found in the Folger-Shakespeare library in Washington D.C., depicts a the story of David and Golliath . Pictorial religious scences like this one were common, as were ornate floral designs like the one done on this binding (also at the Folger-Shakespeare Library). 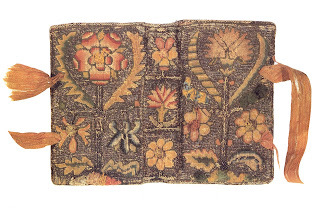 As I researched embroidered bindings, I became curious about how they were made. This information was a little harder to piece together, but I was able to combine some research with my existing knowledge of bookbinding to come up with a working procedure. I won’t bore you with the all of the details, but I will give you and overview of what I did to create my book. The book was sewn on recessed cords, which were then laced through the covers. This creates a flat spine, and a strong board attachment. All three edges of the book were decorated with gold leaf, a long and somewhat stressful process! On the left is a picture of my book in the press after I’ve laid on the first layer of gold leaf. You can’t talk or breath while handling the gold, because at 1/24,000 of an inch thick, it’s liable to blow away! On the right is the book after 2 layers of gold have been applied and adhered the book. It is then burnished with wax and an agate burnisher to make it even shinnier. After the book was completed and everything trimmed to size, I made a template for my embroidery. In order for the finished product to look right, I had to be very precise. The 16th or 17th century bookbinder would probably have sent the fabric out to be embroidered, but I was feeling adventurous and decided to do it myself. I only started learning embroidery this past summer, so my design is pretty simple. After the embroidery was finished, it was time to adhere it to the book. I very carefully put glue onto the book (not the fabric) and put everything in place. I slid some padding between the fabric and the cover to help pull the embroidery tight and hide any bumps. I was very pleased with my first attempt at an embroidered binding, although there are a few things I would change if I could do it all over again. I hope to keep exploring this binding style, and welcome any suggestions from more experienced embroiders! That is fantastic Bexx! Is that the same one you were working on in the shop before the Holidays? I love how it came out! I play with some embroidery in my designs and for your first time well done Bexx! That really turned out well Bexx! Great job! Oh. My. Gorgeousness!!!!! I must visit and take pretty pictures of the process!! Please let me know if I can!